Ethernet VPN (EVPN) is a new technology that is used to extend Ethernet circuits across Data Center and Service Provider networks. It is expected to succeed other L2VPN transport methods such as BGP-based L2VPN (RFC6624), LDP-Based L2VPN (RFC4906) and VPLS. EVPN introduces a set of new features that were not available in L2VPN and VPLS environments, most noticeable of which are All-Active Multi-homing across multiple PE devices and more efficient handling of L2 Multicast traffic. Refer to RFC 7209 to better understand the rationale for creating EVPN. One of the most exciting features of EVPN technology is support for L2 Multi-Homing, where customer CE/Server/VM can be connected to multiple PE devices as depicted below. 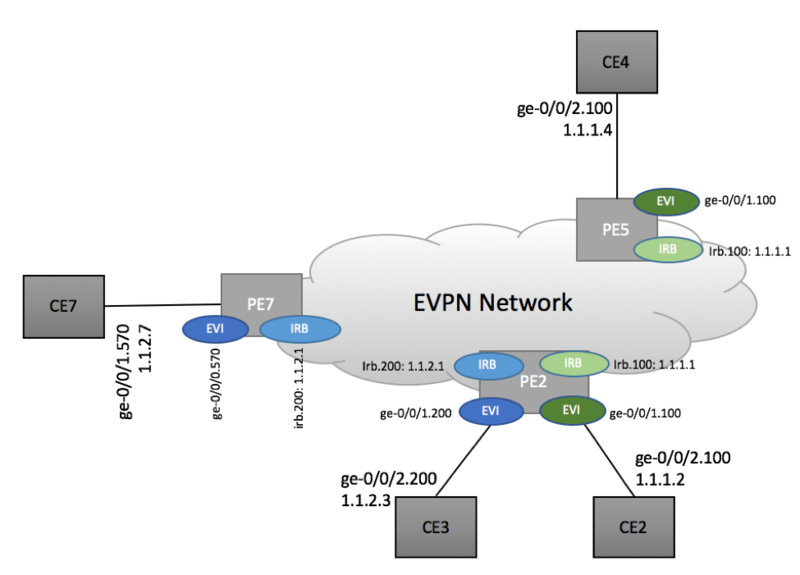 EVPN Type 6 Route is defined in IGMP and MLD Proxy for EVPN IETF draft. The purpose of this route is to distribute Host’s or VM’s intent to receive Multicast traffic for a certain Multicast Group (*,G) or Source-Group combination (S,G). Section 16 of EVPN RFC7432 defines the mechanism for forwarding multicast traffic within EVPN networks. 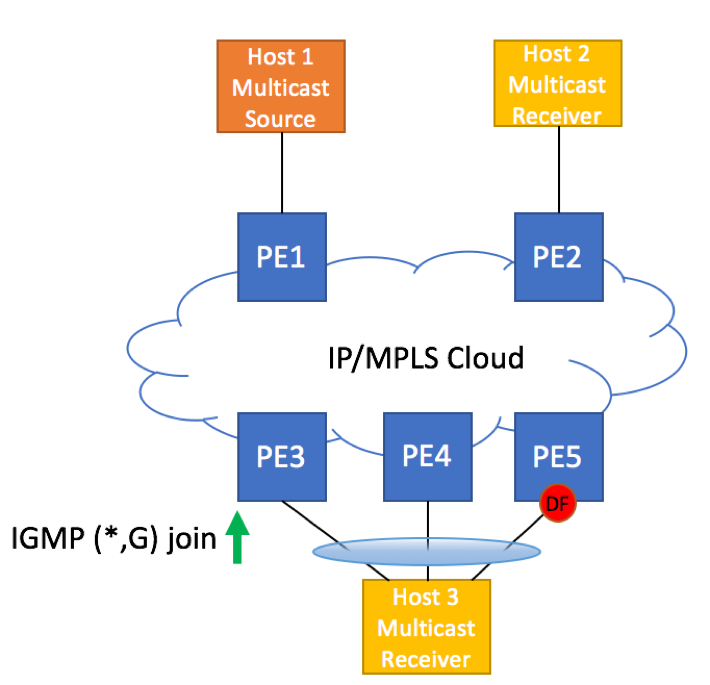 Ingress Replication and/or P2MP LSPs may be used for Multicast forwarding. The major shortcoming of Multicast forwarding approach defined in RFC7432 is the lack of per-group multicast trees, meaning that Multicast traffic is getting forwarded to all PE devices participating in a given EVPN instance, regardless of presence of interested receivers. 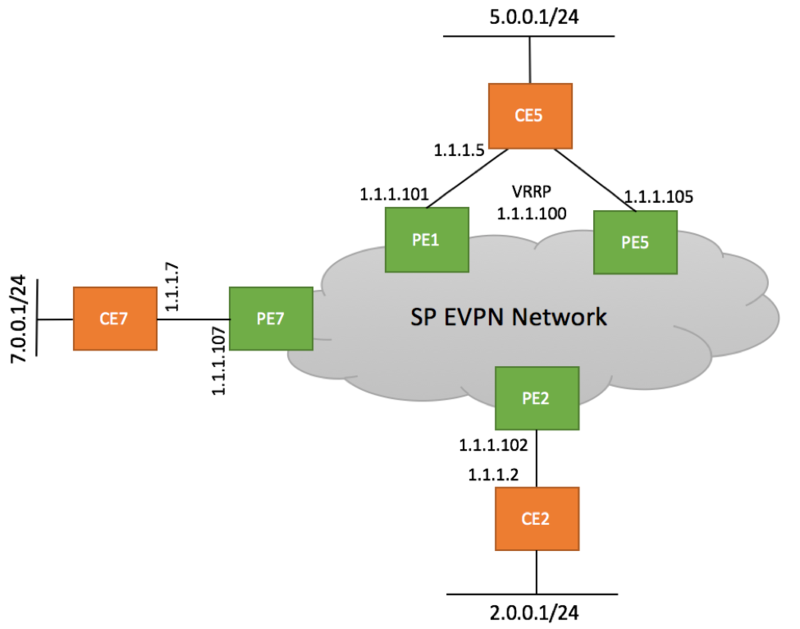 In this article, we will review inter-subnet routing scenarios in EVPN environment. As we will discover, certain topologies might lead to sub-optimal traffic flows within EVPN network. In this example, we will show how to configure L2 and L3 EVPN service on Juniper MX devices. If you are not familiar with EVPN, please review our introductory articles on EVPN. In this lab, we will leverage our previous example, where we delivered L2 connectivity between multiple sites, and will augment it with L3 site-to-site connectivity options. One shared broadcast domain with IP range 1.1.1.0/24 is used on PE-CE interfaces across the entire network. Each CE site is assigned a unique subnet on LAN interface. EVPN Type 5 route that is proposed in ‘IP Prefix Advertisement in EVPN’ draft is a mechanism to carry IPv4 and IPv6 advertisements in EVPN-only networks. While EVPN Type 2 routes allow to carry both MAC addresses and IP addresses, tight coupling of specific IP addresses with IP Prefixes might not be desirable. Section 2.2 of the draft discusses different scenarios where such coupling is nor desirable. With this service interface, an EVPN instance consists of only a single broadcast domain (e.g., a single VLAN). Therefore, there is a one-to-one mapping between a VID on this interface and a MAC-VRF. Since a MAC-VRF corresponds to a single VLAN, it consists of a single bridge table corresponding to that VLAN. Click here for Juniper MX Configuration Example.